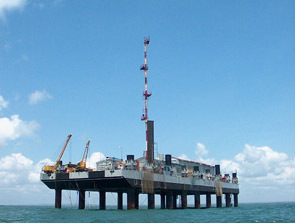 San Marco is Italy's oldest launch site, consisting of a floating platform in the Indian Ocean off the coast of Kenya (2° 56' 18" S, 40° 12' 45"E). The site's near-equatorial location makes it ideal for placing satellites into low-inclination orbits. The Italian space program was conceived in 1960 by Professor Luigi Broglio, Professor Carlo Buongiorono, and Dr. Franco Fiario. By 1962 they and their colleagues had decided that an ocean platform in nonterritorial waters should serve as the base for launching their satellite booster. ENI, Italy's state-owned oil industry, made available a suitable platform, which happened to be named "San Marco" (Saint Mark). The name "San Marco" grew into the designation for Italy's first satellite program (see San Marco satellites), carried out in cooperation with NASA, including preparatory phases not associated directly with the sea-based launch site. Broglio was particularly pleased to adopt the name for the project because Saint Mark was the patron saint of Venice, his birthplace. Saint Mark was also the patron of all who sailed the sea. The San Marco platform consists of a floatable DeLong-type steel barge that can be raised above sea-level by means of a lifting system including 18 pneumatically operated cylindrical legs, each with a diameter of 1.8 meters. The barge is 27.5 meters wide by 91 meters long and has a hull is 4 meters deep. The current weight of the platform is about 2,500 tons with a deck capacity of 5,000 tons.